It’s already well known that manure or poop can be recycled for making products like paper as well as creating biogas power from methane gas. Turning urine or pee into electricity is another matter. This readily available “resource”, whether it be from animal or human origin, is now being experimented with to actually generate electricity by using our pee’s basic ingredients to create enough hydrogen to provide electricity for both homes and businesses. 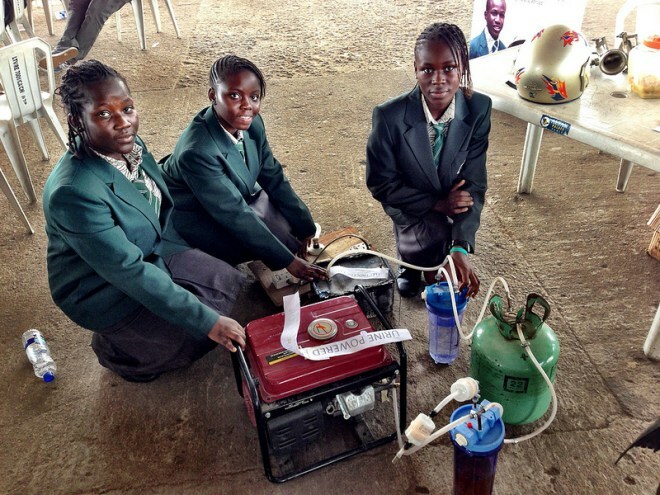 Four teenagers in Lagos Nigeria, working on a school project, created a practical way to separate hydrogen from urine, and then use it to power a generator to create electricity (see photo above). 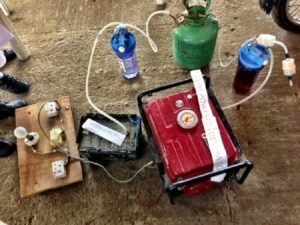 The “pee power” project was entered by the girls in an annual nationwide competition in Lagos, Maker Faire Africa, and it created enough electrical power to run the generator for six hours from one liter of pee. 2. The hydrogen is then filtered in a water filter for purification, and then is sent to a gas cylinder, similar to the kind used for outdoor barbecue grills. 3. The gas cylinder pushes the filtered hydrogen into another cylinder that contains liquid borax, to remove moisture from the gas. 4. In the final step, the hydrogen is sent into a power generator, which creates in electricity. Although still a long way off from being implemented on a mass scale, this basic way of creating electricity from a substance normally disposed of can be a practical way to create electricity in places where normal electrical power has been cut off due to devastation by floods or other natural disasters, including severe storms. It can also be used to create electricity in poor rural agricultural areas that are common in Africa and Asia; including many parts of the Middle East. The Pee Power idea is starting to take hold. Students and faculty at Bristol-based University of the West of England are being asked to use a special urinal that sends all the urine collected there to be used to produce hydrogen for powering an electric generator that creates additional electricity for the campus. If this pee-power prototype project is successful, the idea of using urine produced hydrogen to power hydrogen powered cars is also being considered. Pee as you drive instead of stopping at rest stops? A curious idea. Not bad ideas for a waste product that normally winds up in the sewers. It’s Ok; you can go ahead and do that. for a while but I’ve never left a comment. I’ve bookmarked your site and shared this on Facebook.